A U.S.-Russian crew on Saturday had to turn off autopilot and manually moor their Soyuz spacecraft to the international space station after an unidentified glitch resulted in a dangerously high approach speed - a tough test for the two Russians and an American, none of whom had flown the ship before. The Soyuz TMA-5, carrying Russians Salizhan Sharipov and Yuri Shargin and American Leroy Chiao, was approaching the station so quickly that a danger signal was activated, prompting Mission Control's order for the crew to go manual. When the ship docked with the station as the two spacecraft sailed 225 miles above eastern Europe at 8:16 a.m. Moscow time (12:16 a.m. EDT), just over 49 hours after lifting off from the Baikonur cosmodrome in Kazakhstan on Thursday, cosmonauts and space officials at the Mission Control in Korolyov, just outside Moscow, burst into applause. NASA deputy administrator Fred Gregory, who observed the docking from Korolyov, said that the switch from automatic to manual mode was "seamless." "It appears that the crew was extremely well trained," he said. The crewmen's relatives expressed relief. "We were very nervous. This isn't our first time seeing off a crew, but of course when it's about the people you love, it's a different kind of anxiety," said Lyudmila Lutokhina, Shargin's wife. It was the fourth time a Soyuz has filled in for U.S. space shuttle flights, suspended since the Columbia burned up on re-entry in February 2003. But unlike previous Soyuz missions, none of the crew has flown the spacecraft before, a rare break with a long tradition of having at least one cosmonaut with previous Soyuz experience. Space officials played down the lack of experience, saying that Chiao and Sharipov had flown on U.S. shuttles and insisting that the crew had undergone sufficient training. Soyuz spacecraft are normally guided by autopilot on their approach to the station and during the docking, but the crew is trained to operate the capsule manually in case of computer failure. Mission Control chief Vladimir Solovyov said that the ship was braked and switched to manual controls just 660 feet away from the station. "When the speed became significantly higher than normal, an on-board automatic system warned that the spacecraft were getting dangerously close," Solovyov said. "The Mission Control decided to switch to manual mode, and the crew has performed that brilliantly." Yuri Semyonov, head of the Energiya company, which manufactures Soyuz spacecraft, said it wasn't immediately clear what caused the glitch in the automatic docking system and promised to investigate. Sharipov and Chiao are to replace Russian Gennady Padalka and American Mike Fincke, who are ending a half-year mission on the orbiting station. Padalka and Fincke will return to Earth with Shargin on Oct. 24. 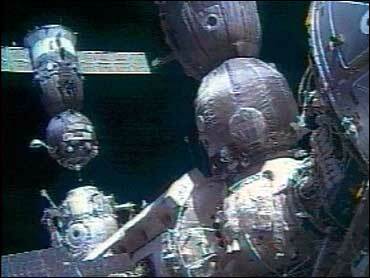 About three hours after the docking, Padalka opened the hatch and embraced Sharipov, the first new crew member to enter the station. Chiao and Shargin followed the captain, and space officials on the ground wished them a productive mission - and wished the crew they are replacing a safe journey back to Earth. "Gennady, I see your hair has gotten too long," Gregory quipped over the radio to Padalka. "It looks like you're ready to go home." During their six-month mission, Sharipov and Chiao will conduct experiments to research new AIDS vaccines and study plant growth, and will take at least two space walks. Sharipov's 16-year-old daughter Nagira and 12-year-old son Dzhakhangir watched the docking at Mission Control anxiously. "I was very nervous this time. My mama and I didn't sleep the whole night," Nagira said. Gregory said that Russia and the United States had completed negotiations on joint flights earlier this month, paving the way for the two nations to work together through April 2006. Negotiations are under way for 2006-2010, he said. NASA scientists are evaluating shorter and longer missions, he said, in response to Russia's desire to send crews up for more than six months at a stretch. Gregory said NASA had hoped its shuttles would be flying again by early spring, but because of the hurricane damage in Florida the target now is early summer.